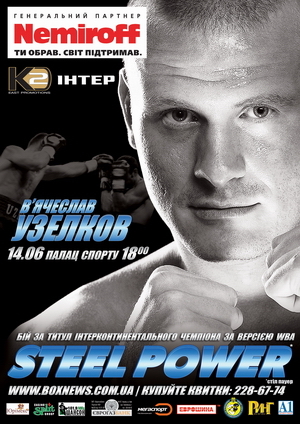 Again «K2 East Promotions» carries out big boxing event – «Steel Power» which is to be held in Kiev Sportpalace on June 14th. The coming event will be the fifth boxing tournament organized by «K2 East Promotions» in Ukraine this year. Thus «K2ЕP» confidently fulfills its plan to organize 10 boxing events in 2008 as it was said at the end of last year. In the main event Vyacheslav Uzelkov (18-0, 11 KO), WBA Inter-Continental light heavyweight champion and one of the key boxers of «K2 East Promotions» promotional company will defend his belt for the second time. Uzelkov won this title in September of 2007 after he KO’ed Gabriel Campillo from Spain in round 6. Uzelkov made his first defense of the belt on February 21st of this year when he faced Argentinean Julio Cesar Dominguez. Ukrainian won that bout by early stoppage in round 3. Now Vyacheslav occupies the 6th position in WBA rankings, the 10th – in WBO and 9th place in the rankings of EBU. In case Uzelkov wins the coming bout he will go up in rankings of main boxing organizations which will bring cherished world championship fight much closer. At the moment there is no information concerning name of his rival for June 14th – possibly it will be announced at the presser on June 4th in Kiev. In co-feature undefeated Maxim «The Tormentor» Bursak (14-0, 4 KO) will make the first defense of his IBF Youth middleweight belt. Bursak captured this belt on April 19th in Kiev when he defeated Mikhail Khucishvili from Georgia (the fight was stopped in round 7 due to Khucishvili's cut). In the undercard of June 14th big boxing event fans will see fights of young prospects of «K2 East Promotions» – Igor Bursak, Timur Akhundov, Allaudin Murtazaliev and Valentin Golovko together with Kostya Rovensky from Lviv and Andrei Rudenko from Dniproperovsk. «Steel Power» at the scales! Today participants of «Steel Power» tournament were put on a serious trial – official weigh-in. As we informed before in the main event of the evening Vyacheslav Uzelkov (18-0, 11 KO), WBA Inter-Continental light heavyweight champion will collide with Slovenian Denis Simcic (19-0, 10 KO).